Since I live, eat, and breathe semiconductors I am very used to hearing that things can “Never” happen only to see them eventually become mainstream. The first column in this table is years. This chart was created in early 2014, so the table only runs from 2005-2013. The next three columns represent Client SSDs: The first column is SLC SSDs, the second is 2-bit MLC SSDs, and the third is 3-bit MLC, which are now more commonly called TLC SSDs. The cells are colored green, yellow, and red to show the prevailing attitude about each type of SSD. In 2005 SLC client SSDs could be purchased “off the shelf” at distributors (“Stock”) while MLC SSDs were never expected to work, thanks to endurance limitations, and TLC SSDs were considered sheer foolishness. Move ahead to 2009 and MLC SSDs were introduced, but were still unusual. In another two years, 2011, that situation reversed itself, with MLC SSDs becoming the norm, and SLC SSDs becoming uncommon. By 2012 TLC SSDs started to ship. Were this chart to extend to 2018, TLC SSDs would be the most common of the three. The last three columns of the table represent the same scenario for enterprise SSDs. Until 2008 SSDs were considered completely unacceptable for nearly any enterprise application, thanks to their low endurance. Still, their speed was so compelling that the industry found a way to get past this problem and SLC (but never MLC) SSDs began to appear. Eventually MLC SSDs became the norm in enterprise applications. The pattern in the enterprise is similar to the client pattern but delayed by a few years. If I were to update this chart I would need to add QLC columns to both the client and enterprise series and update the cells and colors for the years 2014-18 to show that TLC SSDs now account for most of the market. The data center has gained a much better understanding of SSD workloads over the past five years, and now these workloads are split by their write requirements: Workloads with low numbers of writes can be supported by SSDs that are aimed at read-intensive applications, while more costly write-intensive SSDs are only used for workloads that truly require them. SSD controllers and SSD controller firmware have gone through immense changes, including better algorithms and the use of much more sophisticated error correction (ECC) in recent times. This means that flash that was once incapable of supporting enterprise workloads can now be used reliably for these applications. A lot more about this appears in another SSD guy series on controllers. The move from planar to 3D NAND has dramatically increased the size of the NAND flash cell’s floating gate. In older planar technologies the floating gate shrank with each successive process generation, until the difference between a “1” and a “0” amounted to only a few tens of electrons. This is what caused planar NAND flash to stop shrinking after the 15nm node. With 3D NAND the floating gate is considerably larger, lending itself to the storage of many more electrons, and making the bits behave much more predictably in QLC applications. What does the future hold? Well it’s so awfully difficult to move from TLC to QLC that I don’t anticipate any near-term conversion to more than four bits per cell, but The SSD Guy does expect for QLC to find its way into an increasing number of applications in both the enterprise and client markets, lowering SSD prices and subsequently increasing their acceptance. Just to confirm, QLC compared to SLC: QLC for write or read intensive? So also, SLC, for read or write intensive? In my opinion, read-intensive is QLC and write intensive is SLC. Can you also explain please? QLC is for read-intensive applications. As you move from QLC to TLC to MLC to SLC the write endurance continually improves. I wrote another post on TBW vs. DWPD. That might help you understand how they specify write-intensive SSDs compared against read-intensive SSDs. 3 years ago there was plenty of MLC SSDs in my local shop. Today is almost impossible to find MLC one. (almost all are TLC) Are manufacturers completely abandoned this kind of SSDs? 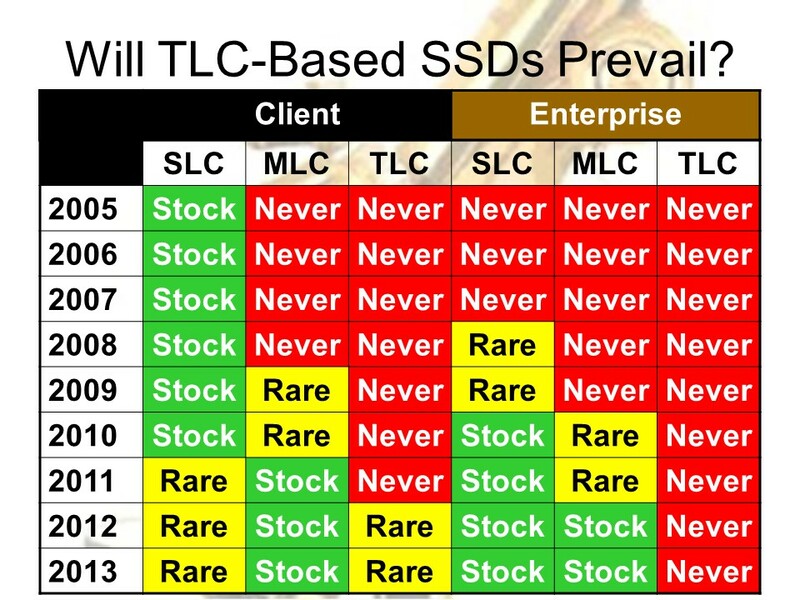 I’m sure you can find MLC SSDs if you really look for them, but the majority are now TLC simply because they cost less. Something about Moore’s Law – it not only allows more gigabytes to be put into the same price SSD, but it also allows more transistors to be used in the same price controller. Today’s controllers are extremely sophisticated, allowing today’s TLC SSDs to have higher endurance than SLC SSDs did ten years ago. I would be happy with TLC as long as the specs were satisfactory. Would you do industry analysis? I really interested to know what happen between March and July. Trade War? NAND price drop between 20% to 50% depending on Size. Or is it everyone in the mobile business has over estimate their sales, with 100M worldwide smartphone less then predicted, NAND maker are running to move those to market? Somehow I missed seeing your note until today. Spot market prices have dropped about 75% since the beginning of the year, but the spot market accounts for less than 5% of NAND flash sales. It’s the most volatile part of the market. Contract prices have dropped more slowly, but they are dropping too. This is because NAND makers are finally making 3D NAND efficiently, and the result is that there’s too much NAND, so manufacturers lower their prices to try to take business away from their competition. This always happens every time there is a down cycle. I’ll be posting more about these price drops in The Memory Guy blog in the future.